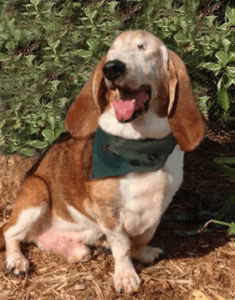 June Schroder had always planned on incorporating animal-assisted therapy into her retirement activities, but when Toto lost his right eye to Glaucoma in early 2013 their plans came to a halt. After taking some time to readjust to this new lifestyle, they set their sights on passing their evaluation. Toto hadn’t skipped a beat and later that year Toto and June became a registered Pet Partners team and member of Health Heelers. 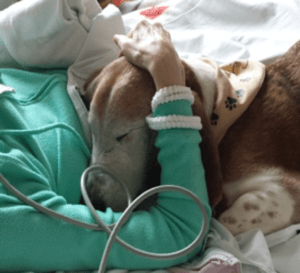 Health Heelers owner and trainer, Laura Hey, felt that Toto’s calm, laid-back demeanor made him perfect for a hospice setting. So off Team Toto was to begin regular, rewarding visits to a number of local hospices. Unfortunately, the Glaucoma returned, causing Toto to lose sight in his other eye. Again, he recovered with poise, learning a few new directions like step up, down, left, right, slow, etc. As long as the furniture didn’t move, he could navigate the home very easily. Still, Toto longed for giving love to patients and families of those in hospice care, tail moving like a perpetual motion metronome. Using his nose and instinct, he would go from person to person, giving nuzzles and kisses, and snuggling on beds of patients. One visit in particular stands out to June. 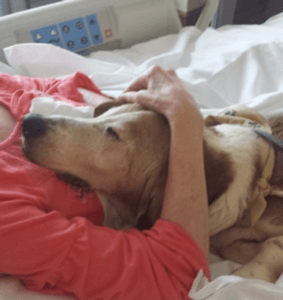 A bed-ridden patient with severe neurological deficits and little movement in one of her hands refused to see the therapy animals for fear of disappointing them. One day, June and Toto stopped by anyway and suggested they give it a try. The patient agreed and June placed Toto up on the bed. Toto snuggled and pushed himself forward, sensing her hand was somewhere ahead, he pushed forward and got his head under her arm. The patients face lit up like a candle; she could pet him! From then until her passing, she was their first stop. 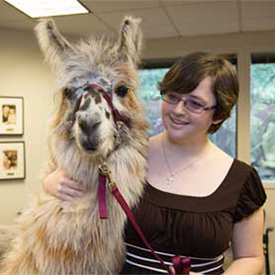 Help teams like llama Comet and handler Kaylee bring comfort to children as they undergo hospital treatments.